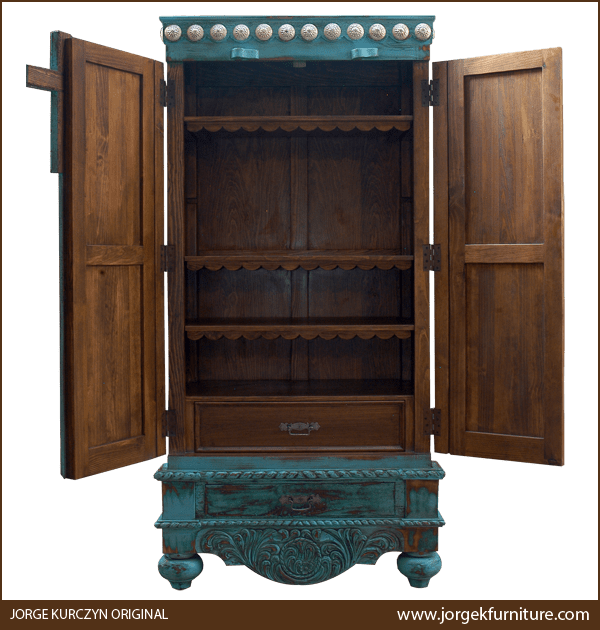 This marvelous, handcrafted, Spanish colonial style armoire has a classic, straight, top rim, with spectacular, silver finished conchos hand tacked to the area below the rim. 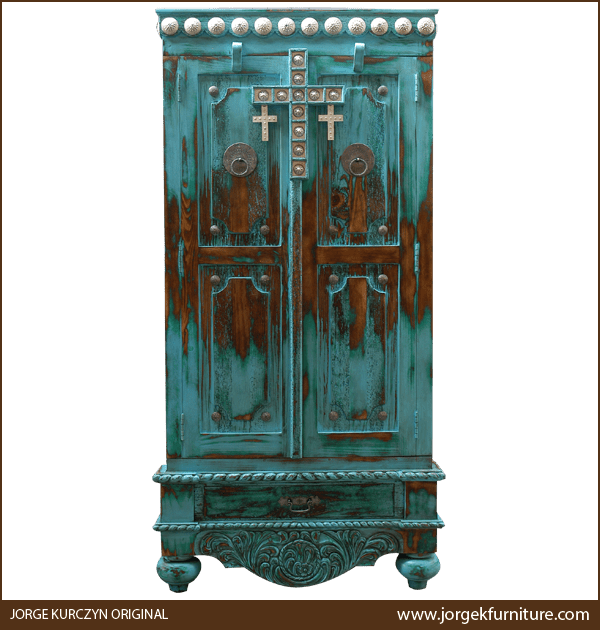 The front of the armoire has two, large, solid wood doors, and centered in the top of the doors is a dramatic, silver finished, Spanish colonial style cross. The cross is adorned with silver finished conchos and with a smaller, silver finished cross on each of its side. Each door has two, geometric shaped panels, and each panel has a silver finished conchos in each corner. Centered in each of the top, two panels is a large, silver finished concho with a hand forged, iron, pull ring. The base of the armoire has a practical drawer for storage, with a silver finished, iron, pull ring in its center. Directly above and below the drawer are elegant, hand carved, twist rope designs. The bottom of the base is adorned with a Spanish colonial style apron, enhanced with luxurious, floral designs. The apron continues on the sides of the base, and each lateral side of the armoire has a rectangular cut panel. 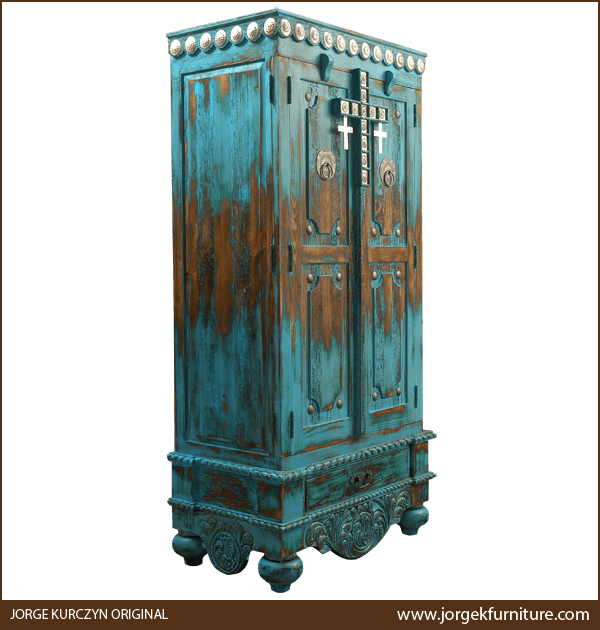 The armoire rest on hand turned, tapered feet, and it has a gorgeous, distressed, turquoise finish. 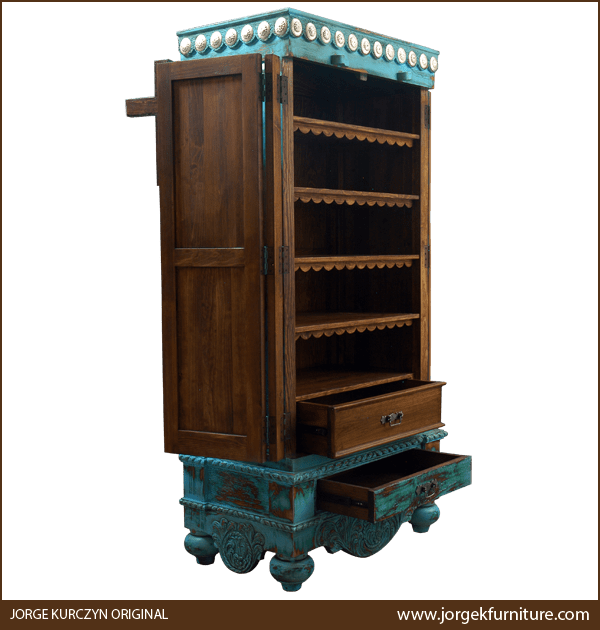 The inside of the armoire has ornate shelving, with a drawer for extra storage. It is made with the best, sustainable, solid wood available, and it is 100% customizable. The armoire can be combined with our Las Cruces bed (bed25), our Las Cruces dresser (dress24), and with our Las Cruces end table (etbl29e).